Specially developed for creative makeup artists, these are not typical makeup sponges, they do not absorb and retain an excess of product or expand when wet. These sponges are durable, easy to clean, and their color hides stains well. 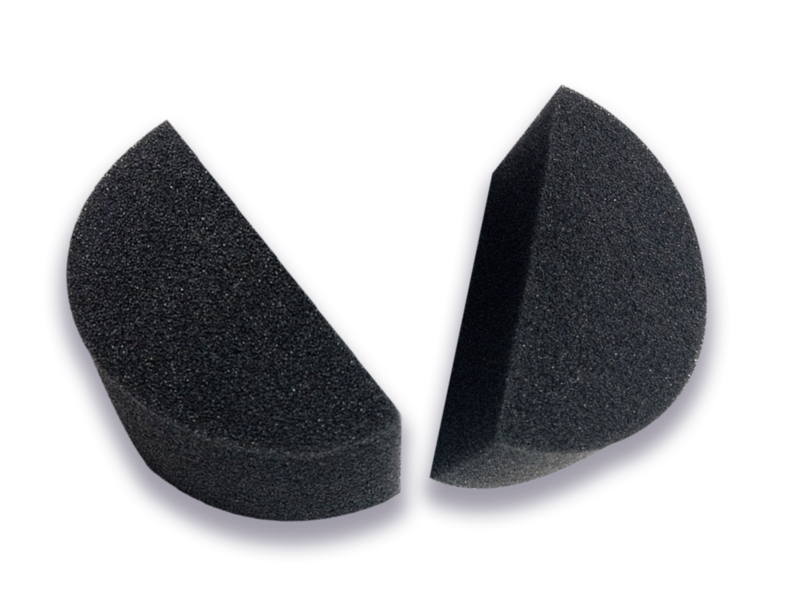 We now offer 3 different shapes using our signature black material. START BUYING YOUR SPONGES BLACK! Our signature black material makes all those pigment stains disappear! This is the sponge of your dreams! Whether you are a creative makeup artist, special effects artist, or a face and body artists, the droplet sponge will quickly become your go-to sponge. The half circle gives you a curved side and a flat side, allowing you to make sharp edges and blend beautifully. We created this sponge for everyone who was already comfortable with this shape but wanted it in our signature material. The small petal shaped sponges are everything you could want in a petal sponge. They wedge into some of the tightest creases of the face. They are firm, silky, and lay down water activated makeup beautifully. This is our smallest sponge measuring 37mm wide and 48mm long. After having so many artists ask, we made it easy to become a reseller or just buy in bulk for yourself. Ordering in large quantities will allow you to get the best prices we can offer. We are the only manufacturer of our specially developed Droplet sponge, offering amazing deals when you buy in bulk! Wanna see how our droplet sponges work? Check out some of our video demos! In this demo, we show you how to paint a colorful full face fantasy cat with our droplet sponges. Here we show you a quick demo of how to load multiple colors onto your droplet sponge. See how you can make colorful circles and easily apply lots of glitter to your designs as we make this fun space scene. Free shipping worldwide on orders over $20 and $5 flat rate shipping on all other orders. we believe in supporting the face painting & Body art community. "Your droplet sponges are amazing!! I use them in almost all of my makeup looks now and at all of my events, their perfect!!!!" "So I got my order and I used them yesterday! Total game changer! I absolutely love them!"